NordicBet Casino has launched the first ever Nordic Casino Championships! There are fantastic prizes for the Winning Country and also the most valuable players, they are giving away a €10,000 watch of your choice plus a trip to a 5 star hotel in Malta plus cash and travel vouchers. 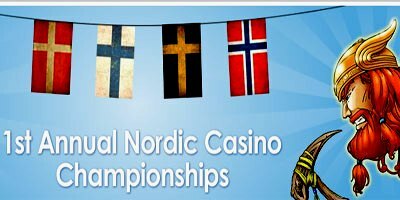 The 1st Annual Nordic Casino Championshipsis a series of tournaments, with one for each country, based on the highest number of game rounds. There's a minimum bet of €0.50 and a minimum of 250 game rounds to qualify. We will show how each country is doing on a leaderboard that will be calculated from the total number of game rounds divided by the number of qualified players for each country. There are fantastic prizes for the Winning Country and also the Most Valuable Player, which will be decided by most game rounds in each tournament! The Winning Country will receive €2,500 cash split across the top 10 players + 25 free spins to all qualified players! The Most Valuable Player of the Winning Country will win a trip for two to Malta! NordicBet willl give them 2 nights at the Hilton Malta Hotel, plus dinners and also a trip to Diamonds International to pick out a watch to the value of €10,000! Indulge by the Mediterranean in one of the 4 outdoor pools at the Hilton Malta Hotel. At the heart of the fashionable Portomaso waterfront, the hotel is 15 minutes' drive from Valletta. Enjoy the Merkanti Beach Club, Water Sports Club and Diving Centeror visit St John's Cathedral. Diamonds International has developed into a household name for fine jewelry, diamonds, accessories and especially watches, representing over 30 high-end, international brands such as Cartier, Zenith, Chanel and Mont Blanc.